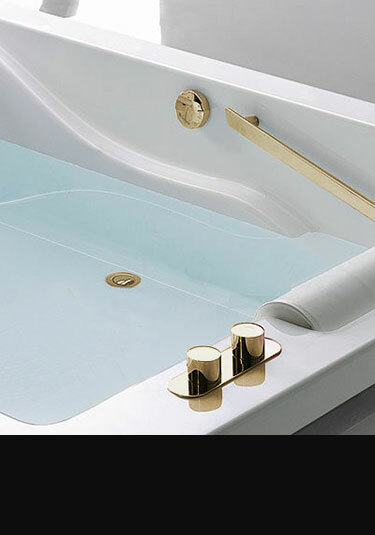 A gold finish in a bathroom makes a luxury design theme for high quality bathrooms. 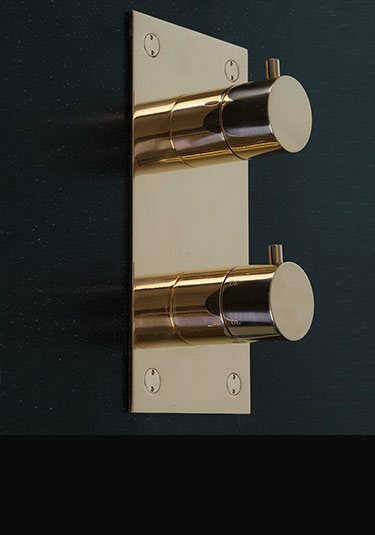 Each tap is gold plated with real gold producing a high gloss finish. These exclusive bathroom taps are designed in the latest contemporary styling and make an exclusive design feature because traditionally most gold tap choices within a bathroom are traditional in style. 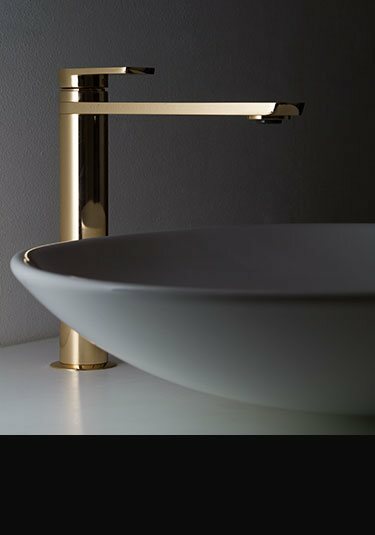 We offer the full range of gold bathroom taps in both yellow and rose gold to produce a contemporary gold themed bathroom. 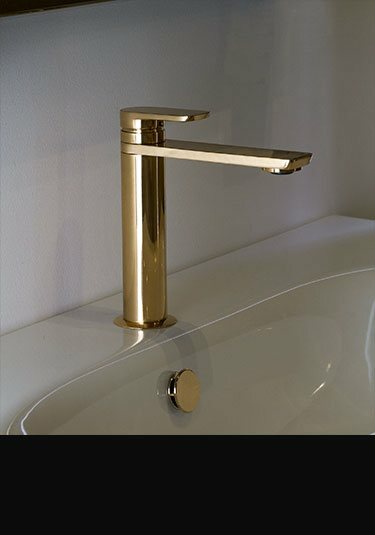 Included are basin taps and bath fillers in wall mounted, deck mounted and freestanding designs plus matching gold shower heads, manual and thermostatic shower valves and other gold bathroom fittings. The latest in contemporary tap design, this modern gold mixer tap has single lever operation and adds a luxury theme to design led bathrooms. In a lovely contemporary design this luxury wall mounted gold basin tap makes designer feature in a modern gold bathroom theme. Italian designed and manufactured. This copper 3 piece basin tap is designed for deck mounting. Plated in a lightly brushed copper plating with a gloss finish. Ideal theme for designer and luxury bathrooms. 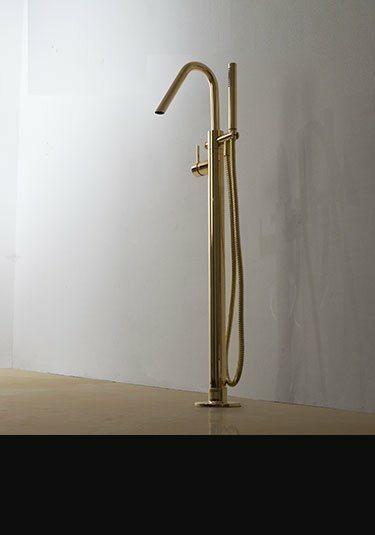 This freestanding bath tap with a handheld shower attachment is finished in real gold plating producing luxury quality gold bath filler in the latest contemporary floor standing styling. 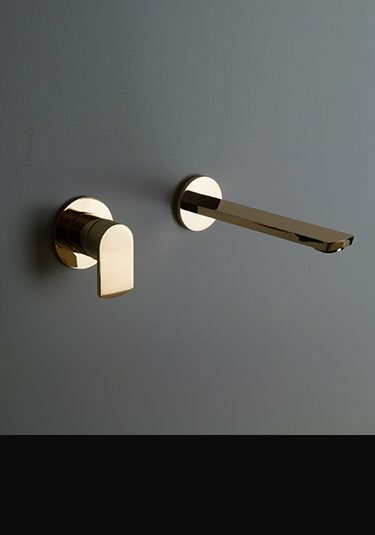 A wall mounted bath filler in a real gold plated finish. This wall mounted bath tap has lovely contemporary styling with easy single lever water mixing, with a gold finish making a beautiful design feature within contemporary and luxury bathroom design. A luxury shower head in a contemporary styling and a gold plating finish. 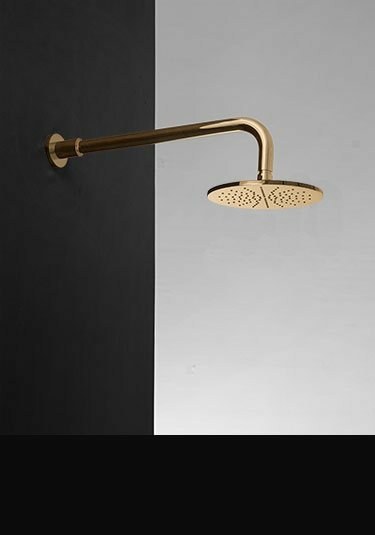 This gold shower head is available in 2 diameter sizes and makes an exclusive and beautiful design alternative to chrome. 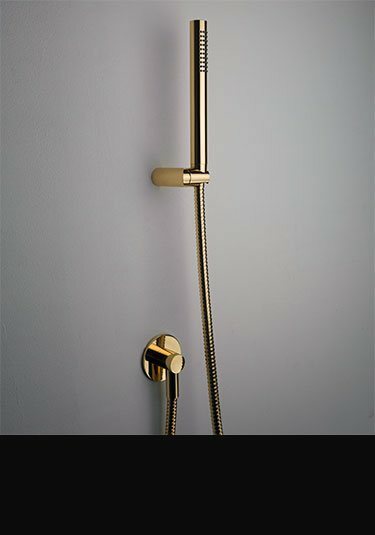 High quality adjustable shower head and slide rail in a lovely gold plated finish and contemporary styled for a luxury finish within a modern gold bathroom design. 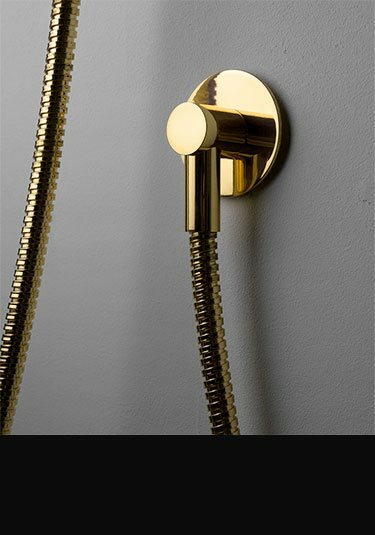 A single or 2 way multi-function shower valve in a gold plated finish. This thermostatic shower control is designed to be recessed flush into the wall for neat contemporary styling. 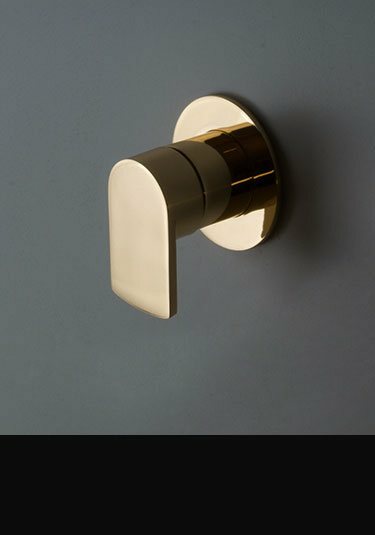 Gold is a luxury finish and makes a beautiful design alternative to chrome. Gold plated handheld shower in the latest contemporary styling. This douche style shower head is designed to be wall mounted onto a support bracket. Using the latest shower control cartridge technology these recessed gold shower valves are both water and energy saving. Nice and simple minimalist design. 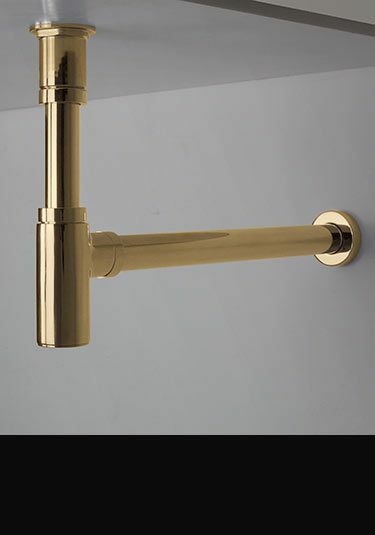 This gold plated shower wall elbow allows a tidy installation of flexible shower hoses. 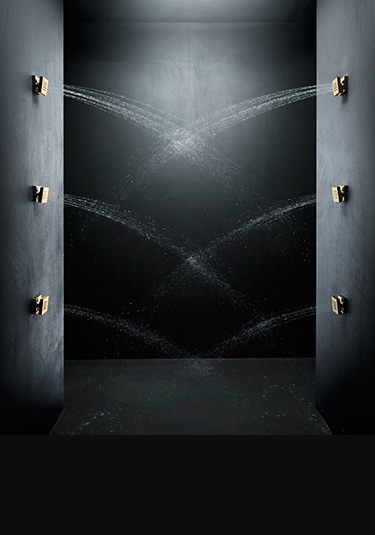 These shower water wall outlet is part of a full range of gold bathroom taps. Beautiful quality gold plated basin bottle trap makes a lovely and tidy finishing touch and is part of our matching gold bathroom taps collection. Luxury quality gold basin waste finished with real gold during the plating process. 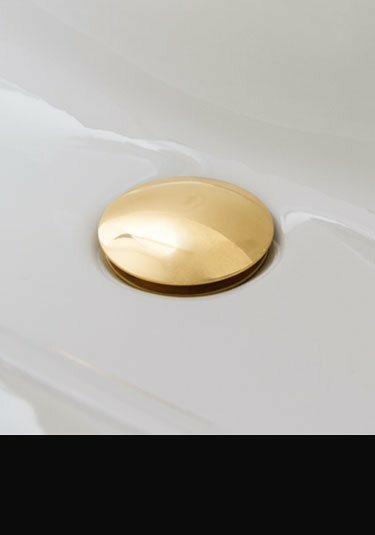 This sink plughole waste has a click clack opening mechanism and is part of a full range of matching gold bathroom taps. Gold bath waste with integrated overflow and pop-up mechanism. To complete a gold bathroom theme and to compliment gold taps and bathroom accessories Livinghouse can supply matching towel radiators. 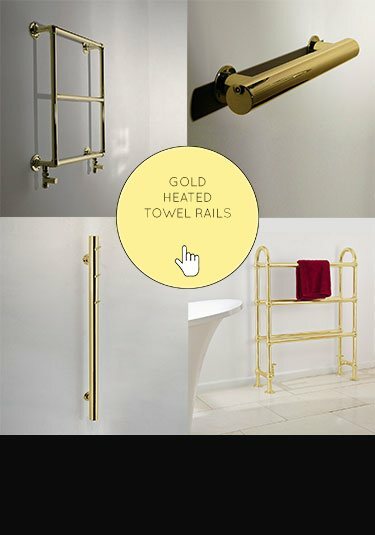 These lovely quality gold towel radiators and heated towel rails are manufactured in Europe in a real gold plated finish and available in both stylish traditional designs and the latest contemporary styles. 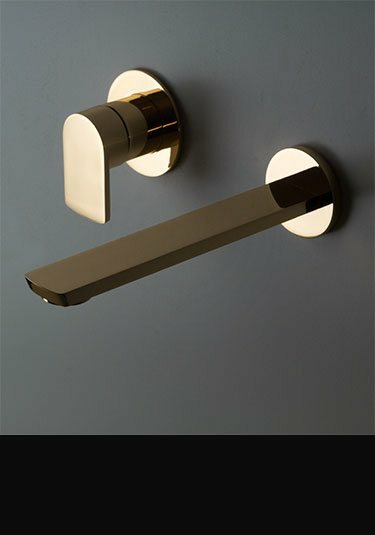 One of the issues of a gold plated bathroom theme is having matching gold bathroom accessories and shower fittings. 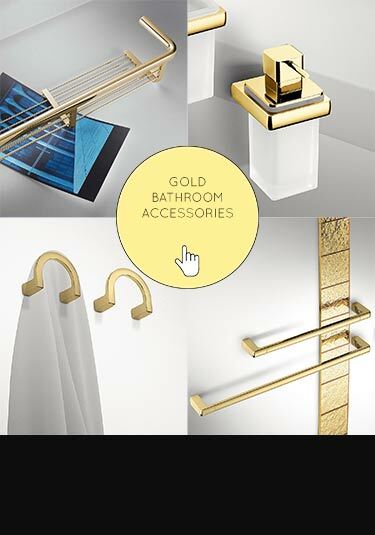 Livinghouse offer Italian designed and luxury quality gold fittings including tooth brush, toilet brush & toilet roll holders plus matching towel bars & shower baskets.